Stores and other retail establishments must exercise reasonable care to ensure the safety of their patrons. This means keeping entrances, the lobby, stairways, walkways, bathrooms, and all other parts of the property reasonably safe for patrons and guests. If a business fails to exercise a reasonable care and as a result you are injured in their establishment, the owner can be held responsible for your injuries or loss. If you have been injured in a store, restaurant, nightclub, or other retail establishment, a San Diego slip and fall attorney can help you hold the store accountable and recover financial compensation for your injuries. The standard of care, or degree of reasonableness, required of store owners is that they must take reasonable measures and steps to protect your safety while you are on their business premises. This means that the store owner must keep an eye on the premises and promptly clean up a spill (even if caused by other customers), and promptly remove debris from an aisle, so that you don’t trip and fall over an object and injure yourself. Similarly, if a store sells heavy items, reasonableness in protecting customers means having store personnel grab the boxes for customers or placing the heavy items on lower shelves. If the store places the heavy items on high shelves, customers are likely to drop them on their head or in an aisle, causing an accident. Store owners must use common sense and take reasonable measure to protect you when you are visiting their business establishment. Your injury attorney will establish liability in a slip and fall case quite different from most other types of accident or injury cases. In many types of accidents, there is a set of rules and regulations, or customary standards of practice, that define what is acceptable conduct and what is negligent conduct. In car accidents, fault is primarily determined by the rules of the road. In airplane crash cases, fault will usually fall on a pilot who did not follow protocol or violated Federal Aviation Administration (FAA) rules. In slip and fall cases in a retail establishment, there usually will not be a set of rules and regulations that clearly define liability. Instead, an owner of a retail establishment will be held to a reasonable standard of care and required to keep the premises reasonably safe. How Careful Must Businesses Be? Just how careful must businesses be in ensuring your protection? The law expects all people, business owners included, to act as reasonable careful people performing the same duties. So managers and employees of an establishment must act as a reasonable careful people. The reasonable careful standard is usually that of a very careful person and not just what your average person would or would not do. Many people are careless and the average person may be slightly careless. Slight carelessness does not protect you in the world of personal injury law. If someone, such as the employees or management of a store, were slightly careless (or negligent) and caused an accident or caused you to be injured, your slip and fall attorney will be able to hold them fully liable for your injuries or loss. This does not mean that if a store does not clean up a spill instantly the store owner will be responsible for your injury. Instead, the management has a duty to check for spills regularly on a period basis to make sure the aisles are not wet. If there is a spill for a few seconds and the store cannot get to it before you fell, the store owner likely will not be responsible. But if a spill is not cleaned up for two hours and you fall and injure yourself, the store owner will most likely be responsible for your injuries. In the case of a spill that leads to a slip and fall accident, liability is also dependent upon who caused the spill. If the employees or personnel caused the spill, the business establishment will be liable, even if you slip within seconds of the spill. But if a spill is caused by a customer, then the store or business will be held to a standard of reasonable care in responding to and cleaning up the spill. Stairs can be dangerous for a variety of reasons, leading to a slip and fall or trip and fall accident. For example, if the stairs are far too slippery because the business establishment chose to make them that way (so they would be more shiny) instead of making them less slippery and more safe, the owner could be held responsible for your injuries. Also, the stairs may not have proper handrails, or a stair may be loose, causing you to fall and become injuries. With outdoor steps, the management may have neglected to have a nonslip surface, creating an unreasonable risk of injury when it rains and the stairs become wet. Often, the stairs may not have been constructed in compliance with applicable building codes (for example, regarding step height or step depth), which would help to show that the stairs were unreasonably dangerous or defective. Safety inspections, both their existence (or nonexistence) and their frequency, can be a key factor in a slip and fall cases. If a retail business does not maintain adequate safety procedures that are documented in a report, this could point to negligence on the party of the business owner. If safety inspection reports do exist, your lawyer can argue that the inspections were not conducted with sufficient frequency or that the reports themselves evidence that the procedures are inadequate to keep the establishment in a safe condition. 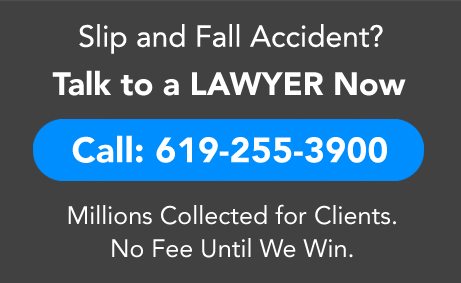 If you have been injured as a result of a fall due to a business establishment negligently failing to keep the premises in a reasonably safe condition, contact Injury Law Group today and speak with a San Diego slip and fall attorney. We’ll fight hard to protect your legal rights against the store or business whose carelessness and inattention to your safety resulted in your injuries, while you focus on recovery from your injuries.